We added planks to our breakfast room walls! 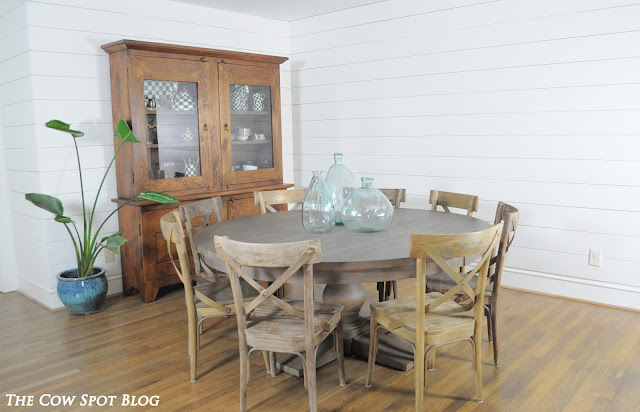 Our breakfast room is a space we use a lot, but you have seen very little of here on the blog. The area sits right off the kitchen and is a highly utilized area of our home. We eat there, we work there, I fold laundry there, it's really a central hub for us. The space is big and currently holds our china cabinet and a large 6' round table we purchased right after we moved in. Not bad, just a little plain. This house is full of giant walls and this space is no exception. I've done pretty much nothing in this area since we moved in because I am stumped on how to decorate the big blank wall. 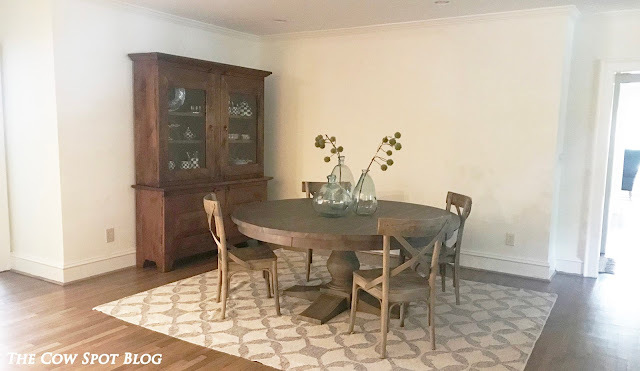 One element that really helped add life and interest to another big, blank space in our house was the shiplap or planking we added in our mudroom area, so we started talking through the idea of adding it in this space as well. Not only were we sure the planks would up the cozy factor, but we thought it would add some nice balance to the back of our house. We have an open floor plan and the breakfast room is in the same visual area as the mudroom; So, the addition of planks here would add cohesiveness. This conversation got kick started as we made plans to have our first floor painted. We didn't want to pay to have the wall painted only to cover them with wood. So, Brent asked the painters if they did trim work. Turns out they did and were able to provide us with a very reasonable quote to add 1 x 8 planks to our breakfast room. It caused us a little heart ache to pay for something we knew we could do ourselves, but at the end of the day it just made sense to go this route this time. Time being the main reason. Still no art, but the room feels 10x's warmer and more interesting. The crisp white color and additional 4 chairs we got for Christmas help too! Oh, and I'm testing the universe and TRYING to pull some of my plants out of the hospital to see if they can thrive in other areas. Fingers crossed!